Here are free rabbit cage plans below for an all-wire rabbit cage measuring 36 inches wide by 30 inches deep. The cage you build with these cage plans can serve as an indoor or outdoor rabbit cage. Consider purchasing one of our e-books. Do you own one or a few pet rabbits? 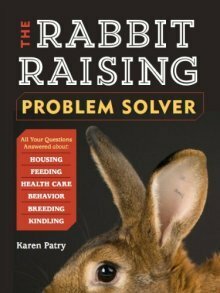 Pet Rabbit Living Spaces, our e-book for pet rabbit owners, is available for immediate download. Click the link for more info. 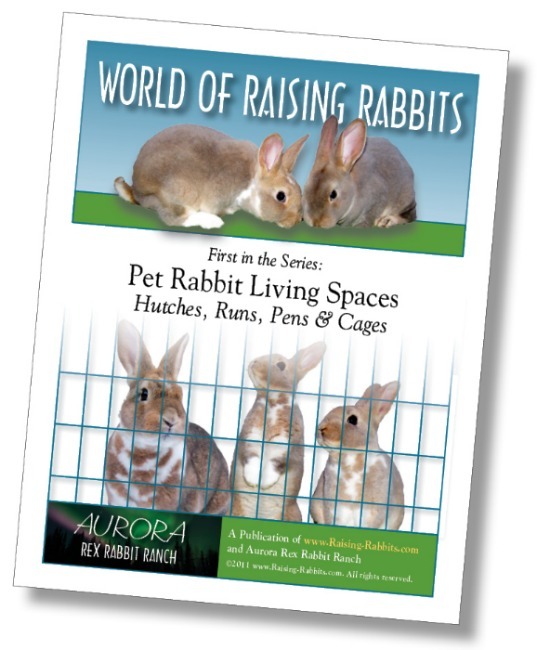 Pet Rabbit Living Spaces includes tons of illustrations for building this all-wire cage, various other cage dimensions, and many more options for pet hutches, cages, even a run and a pen. It is priced at an extremely affordable $6.49. 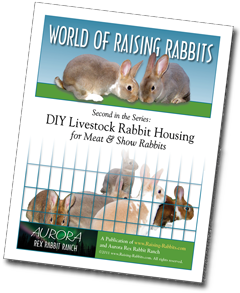 Are you a meat rabbit breeder or a breeder of show rabbits? DIY Livestock Rabbit Housing is available at a low price of $8.49. Do you want ALL our Cage and Hutch Frame Plans? 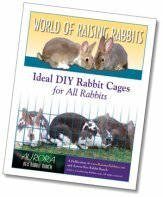 BOTH of the above e-book plans are included and available in one comprehensive e-book containing ALL plans: Ideal DIY Rabbit Cages - Click here for more info or purchase below. 1 inch by 2 inch by 3 feet wire - 14 gauge, approximately a 10 foot length. 12" J-Feeder. See picture of finished cage. You can also use a crock for food. For a 9 pound doe and her kits, a crock would have to be large, unless you feed twice a day. Water crock. Or better, an automatic watering system. Edstrom makes a great system. 1) If you purchased 2 1/2 feet of 3 foot cage floor wire, this piece is ready as is. If you purchased enough for several cages, then cut a 30 inch x 36 inch piece. Cut the protruding wires flush for this and all wire pieces. First: If you cut a 24 inch x 36 inch piece of wire for the back (since the roll is 36 inches tall) and then trim it to the indicated 24" x 18," you'll have a piece left over that is big enough to use for the door, with very little waste. 6" of cage side wire will wrap to the back on both sides, reducing the amount of wire needed for the back panel to just 24 inches. 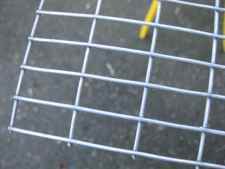 3) Set the 30 x 36 piece of rabbit cage floor wire on your sawhorses or work space. An important caution: you need the 1/2" wires to be on top where the rabbits will stand, as shown on the right. This is much easier on the rabbit's feet. 4) Bend 6" of the side panels around a 2x4 or sawhorse, so that the final lengthwise measurement of the piece is 30" x 18". The extra, still-attached 6" length will wrap around and become part of the back of the cage. We wanted rabbit cage plans that save time by not having to cut wire, and that eliminate wire waste. 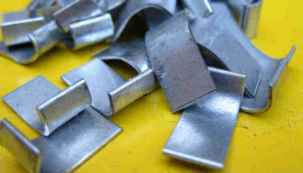 5) Attach the side panels to the floor with J-clips, as shown. You can also use hog rings if you have them, and hog ring plyers. I've always used J-clips. I attach them roughly every 2" or 2 1/2". 6) Attach the back panel using J-clips. Because you've wrapped wire from the sides, the back panel is only 24 inches wide. There, you've saved money! 7) Attach the front panel using J-clips. 8) Attach the top panel using J-clips. You could substitute hog rings for the J-clips in the rabbit cage plans. In that case, you'd also need hog ring pliers. 9) Locate where you'll place the door, and cut a 12" x 12" hole in the front panel. Allow 2" of cage wire at the bottom and 4" at the top. If you're right handed, you might find it easier to reach into the cage if the door opening is placed towards the right of the cage. (Left side if left-handed.) Leave about 6", however, to the right of the door, so you can attach a water valve or a hay feeder. 11) Attach the rabbit cage door with J-clips: Two at the very top bumping each other (to help keep the door positioned without sagging), a couple in the middle, and one or two clips at the bottom. 12) Attach the latch to the door with J-Clips. There are a number of great latching systems, each designed a bit differently, but getting the job done well. 13) If you decide to use J-feeders, now is the time to cut a 12" x 2" hole in the front of the cage, 2 inches off the floor. 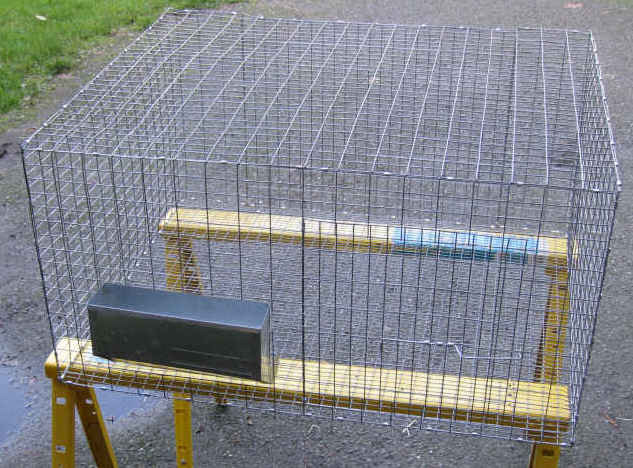 The feeder will hang on the outside of the cage, and deliver the feed to the rabbit (and bunnies) on the inside. Congratulations. 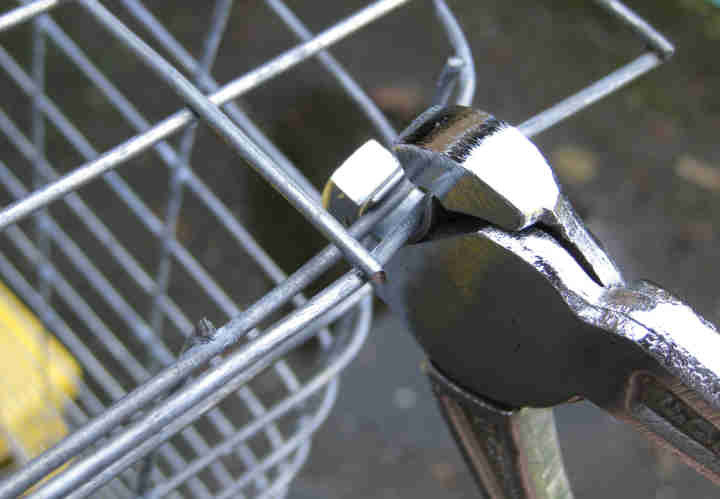 In an hour or less, you followed these rabbit cage plans and made your own homemade rabbit cage. Not everyone feels like building their own rabbit cages. We think we get the most value for our money by building our own cages with our rabbit cage plans and we think you will too.